This week’s article is written by CUESA volunteer Janet McGarry. In 1997, Augusta founded Multinational Exchange for Sustainable Agriculture (MESA), based in Berkeley, to connect food and farming change-makers worldwide, while spurring innovation and preserving traditional knowledge. MESA provides international training for farmers and advocates at sustainable farms and organizations to build ecosystem stewardship, fair food economies, and cross-cultural collaboration. 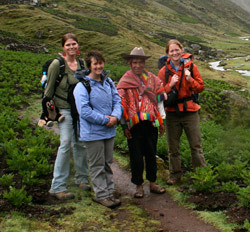 Programs are offered in the United States, Peru, and Thailand and soon in Mexico and Sri Lanka. The program integrates experiential training with an online curriculum and awards a Certificate in Global Agroecology and Local Food Systems under a U.S. State Department designated Training and Cultural Exchange Program. 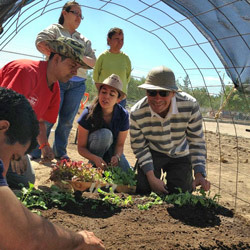 Over the years, MESA has connected more than 1,250 people from 33 countries and helped start approximately 140 small farms and food justice projects. The U.S. Core Training Program begins with an orientation at an organic farm in Northern California. Program participants, called “stewards,” apprentice at one of many host farms located all over the country. During their stay, stewards learn about organic, biointensive, biodynamic, and permaculture production, as well as marketing and community organizing. Many stewards receive scholarships, while host farms help cover lodging, stipends, and training costs. MESA also provides financial support and mentoring training to hosts via on-farm project grants. After staying at their host farm for six to eight months, the stewards travel back to San Francisco for the final part of their training, which includes a tour of the Ferry Plaza Farmers Market with CUESA staff. The 2013 group of 19 stewards hailed from all over the world: Ecuador, Sri Lanka, Peru, Thailand, Ghana, France, Georgia, Mexico, and the U.S. Many stewards are in their twenties or thirties, although there are no age restrictions for applicants. MESA steward Sanjana Silva (pictured at top), an agricultural extension officer and activist from Sri Lanka, trained at Ecology Action in Willits, California, where he learned Grow Biointensive farming. “We are depleting soil rapidly,” he says. 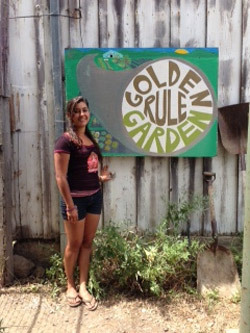 “At Ecology Action, I learned how to grow soil, not just food. When the stewards return to their home countries, 50 to 60% work in food production and marketing, 20 to 30% work in advocacy, education, or policy, and 10 to 20% work in other areas. Steward alumni can apply to MESA for Sustainable Project and Innovation Grants (SPRIG) to fund projects in their countries. Many such projects have focused on bringing the lessons they’ve learned back home through farmer trainings, demonstration plots, farmers markets, CSAs, and community outreach.